From the 1980s to the early 2000s, Medellin, Colombia was often dubbed “the most dangerous city in the world.” It was infamous for Pablo Escobar, drug cartels, murders and kidnappings. However, since those dark times, Medellin has undergone a dramatic transformation. The government has invested in public transportation and social programs that have increased safety and improved the quality of life in many neighborhoods- particularly Comuna 13. In 2013, Medellin was named the “most innovative city in the world” thanks to its modern and clean Metro system. This Metro system is a source of a pride for the citizens of Medellin. Comuna 13 was once considered Medellin’s most violent neighbourhood. Due to its convenient location near Medellin’s main highway, it was the gateway to a popular drug-trafficking route. In the 1980s, Pablo Escobar controlled the area. After his death, gangs and paramilitary groups fought over the neighbourhood, with murder rates tripling between 1997-2002. Many innocent civilians were killed or injured. Since those troubled times, Comuna 13 has transformed into a much safer place thanks to the Metrocable system. These cable cars connect Comuna 13 to the rest of Medellin, providing its residents with more convenient access to the city and jobs within it. The Metrocable improved safety as it allowed people to avoid walking through dangerous territories. The escalator system, which has six sections and a distinctive orange roof, has also increased the quality of life for the residents of Comuna 13. What was once a strenuous 30-minute climb (equivalent to 28 stories) up a steep hill is now only a 5-minute escalator ride. Before it was built, residents had to climb up and down the stairs if they wanted to go shopping, visit the doctor, or go to work. In the late 2000s, local artists started creating street art depicting the area’s violent history as well as expressing their desire for peace, hope and transformation. Many of the murals are of birds, which symbolize freedom. 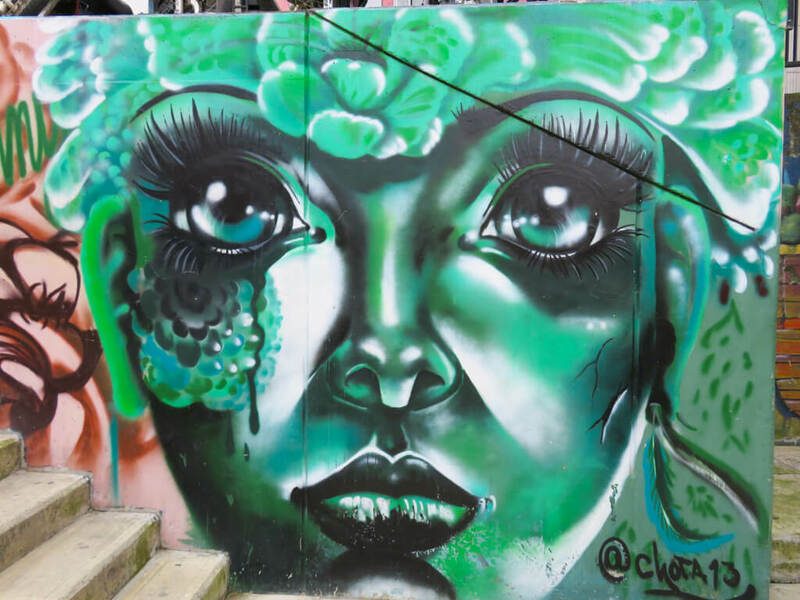 Medellin’s government provides funding for local artists to create street art in the area. It has also donated money to open schools and libraries. The art has created more opportunities for the local youth and helped steer them away from drugs and violence. To get to Comuna 13, you need to stop at San Javier metro station. From there, you can either walk for 15 minutes or take a small green bus that goes directly to Comuna 13. The bus has a small sign that reads “Escaleras Electricas” in the front window. Although safety in Comuna 13 has improved a lot, it’s better to visit it with a tour or at least in a small group as lower crime doesn’t mean no crime. Gangs still exist, so you should visit Comuna 13 in the daytime and avoid wandering away from the main paths. Since I wanted to learn more about Medellin’s history and the street art, I decided to take a tour. I chose Comuna 13 Tours and booked by email. Response time was very quick. The tour cost 70 000 pesos and the guide collected the money from everyone at the end of the tour. The price includes an arepa and juice at a food stand and a delicious popsicle at the end of the tour as well as metro and bus tickets. I met the guide, Walter, and the rest of the group at the Poblado metro station entrance. Walter spoke excellent English and told us lots of interesting facts during the tour. From Poblado Station we took Line A of the metro to San Antonio station. I was amazed at how spotless the stations and trains were. From there we switched to Line B and traveled to San Javier station. At San Javier station, we took a ride on Line J of the Metrocable. I had taken cable cars before, but over scenery, not over actual houses or buildings, so it was a fascinating experience! Being able to ride in a cable car over a city felt very futuristic. From the cable car, you can see the contrast between Medellin’s rich areas and poor areas. The wealthy neighbourhoods are lower, mostly in the valley while the poorer neighbourhoods are perched high up along the mountainsides. After the cable car ride, we boarded a small green bus at San Javier station. It was a short ride to Comuna 13, where almost immediately we saw street art! One of the most famous artists in Comuna 13 is Chota 13 (Instagram). Sometimes during the tour, you can meet the local artists or visit their gallery. Walter took us to meet Jorge (Instagram) and look at the artwork in his gallery. If you want, you can support local artists by buying their artwork, but there wasn’t any pressure to do so. At the top of the escalators, you will find even more art. There is a painting of two lovebirds and couples are encouraged to take a photo with the birds! The mushroom art is supposed to be for solo travellers. While admiring the art we passed by teenagers break-dancing and listening to hip-hop music. Children were shouting and playing happily, so Comuna 13 felt very safe. Twenty years ago, people were afraid to leave their homes even during the day, so that shows how much conditions have improved since then! As we made our way back downhill, Walter took us to an old man’s house for some homemade mango popsicles. They were delicious! We sat on the porch and enjoyed them. After our snack, Walter escorted the group back to Poblado station and helped everyone with directions or hailing taxis. I’m glad I visited Comuna 13 and saw the area’s impressive transformation for myself. Comuna 13 is truly a symbol of hope for Medellin and has a bright future ahead of it! A really interesting read and really well written. I think it’s fab you put the effort into learning more about the city. My parents in law loved Medellin and the people there, and you’ve just added another reason to visit! What a refreshing read – its always so much more fulfilling visiting somewhere slightly off the beaten track with such a vibrant history – literally! Street art is one of my favourite things to photograph and discover within a city and you have captured Comuna 13 so beautifully! Beautiful street art! It really makes a place so much more special. And the view from that cable car is also pretty spectacular!